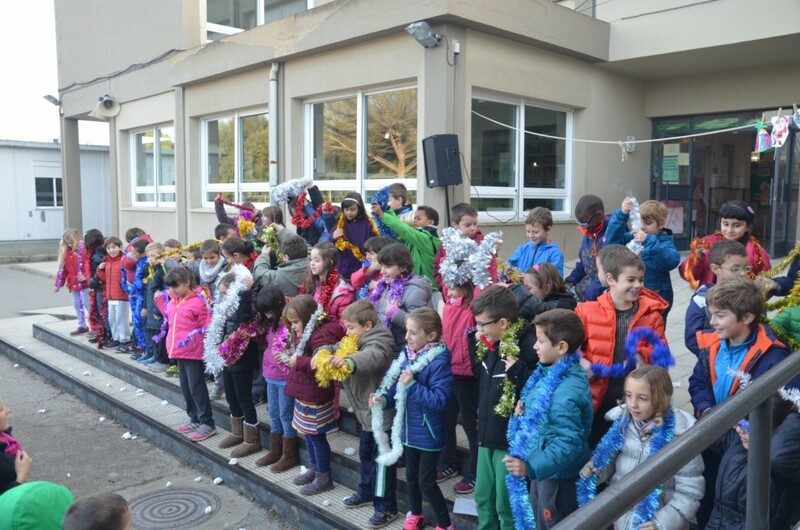 We want to wish you a Merry Christmas and a Happy New year in an special way: singing and dancing “Crazy Christmas”! We hope you like it! Enjoy these Christmas days! Etiquetes: Cicle Mitjà i English. CHRISTMAS TREES 3rd AND 4th GRADE We celebrated Christmas by making these nice Christmas trees. At the beggining it seemed very complicated, but finally the result was beautiful. If you want to make it at home, you can follow the steps of hoq to make it on this web page: https://www.youtube.com/watch?v=TZAsOQiZMEs We decorated our trees with the star on the top!!! Etiquetes: Cicle Inicial i English. SNOWMAN 1st and 2nd GRADE We celebrated Christmas by making this beautiful snowman. First of all, students had to cut and fold the paper to get a shape of a anowman. Then they cut and sticked a black hat, a carrot nose and a scarf. Then they had to draw a snowman’s eyes, mouth and buttons. They could decorate it on their own way: red cheeks, colorful buttons… Than, we decided to draw a Christmas Tree and this is the result. These students are real artists!!! HALLOWEEN 4th GRADE We celebrated Halloween at school by making our own scary black cats. Some of them are really scary, and some of them are so sweet!!! Some of them are very fat, and others are slim, some of them are tall, and some of them are not… But all of them are black Halloween cats and they are made with lot of dedication. We celebrated Halloween at school by making our own scary orange pumpkins. Some of them are really scary, and some of them are so sweet!!! Some of them have got scary eyes, nose and mouth and others are very sweet. AUTUMN PROJECT 1st GRADE As a part of an Autumn Project, we studied the parts of a tree (branches, trunk, leaves, roots…). The final part of the project was to draw a tree and to color and cut different leaves and stick them to the branches of the tree. Finally students had to describe their tree in pairs: Our tree is brown and the leaves are red, brown, orange… Here you have some of our trees! Here you can find the Toontastic videos that we did in the English lessons, in the 5th and 6th grades: 5th A https://youtu.be/QbbN8-MNj_k 5th B https://youtu.be/cx9KBwdzeqI 6th A https://youtu.be/s69HNFT5rXI 6th B https://youtu.be/RyX4FuSWlg8 6th C https://youtu.be/GdcJwb5S6xM We hope you like them! Here you can find the Toontastic videos that we did in the English lessons, in the 3rd and 4th grades. 3rd A https://youtu.be/eX2dwOca2VY 3rd B https://youtu.be/uquaP3uQSw0 3rd C https://youtu.be/jD2mADD5SBI 4th A https://youtu.be/DyizUCE8dDw 4th B https://youtu.be/h5_y7x5aRm8 We hope you like them! Here you can see the Toontastic videos that we did in the English lessons, in the first and second grade. 1st A https://youtu.be/IsZtTgN6I-Q 1st B https://youtu.be/WAf6-v6LM5g 2nd A https://youtu.be/XC7ILcdIa1k 2nd B https://youtu.be/5KBrSI_bXXs We hope you like them! Here you can see the Toontastic videos that we did in the English lessons, in P4 and P5. P4 group 1 https://youtu.be/0HguGmbdjS0 P4 group 2 https://youtu.be/ebA9sBtzsTM P4 group 3 https://youtu.be/hjO_EfdhM1w P5A group 1 https://youtu.be/eQYtIEsZR20 P5 A group 2 https://youtu.be/cCo8_5xumQU P5 B group 1 https://youtu.be/GRx1npFmx3A P5 B group 2 https://youtu.be/yviSQh-aKT8 We hope you like it!